Hello Sara, you know, I lost my mother a little over seven months ago and since then I have been looking every day for some form of contact with her. Do you remember when I wrote to you about the time when, a few days after her death, I heard in my head the following words: “Hello Stefano”.? Yesterday, 2 January 2010 something happened that filled me with joy. After lunch I took a little break and listened to some relaxing music in the background. Right at that time I was thinking about my mother and I asked her for a strong message from her to me. At about 17:30 I went with my father to see the Live Nativity which takes place every year here in the town of Ladispoli (Italy), inside the Palo Laziale Forest. We have been living here for almost three years and we never went to see it. It was nice, there was a wonderful music as a background accompanying the visitors all the way along the path, right up until the exit. Obviously I had with me a digital camera and I took a few pictures. During that visit my thoughts went to my mother, almost certainly due to the atmosphere inside this forest, with actors intent on representing the Nativity and the wonderful music everywhere. 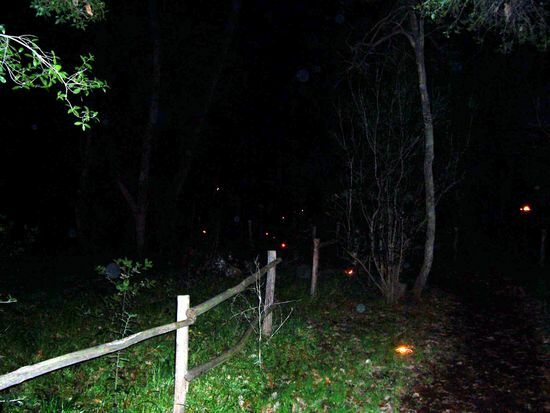 Once I got back home I looked at the pictures and on one of them I saw some orbs, exactly in the tract of the path where I was thinking about my mother a lot. It’s the first time that this happened to me and this did not happen on any other picture. I thought back to the desire that I had expressed in the first afternoon while I was resting.